Revelations 12 fulfilled this September? Wait there’s more…! This is a great video that walks through all of this very well. It is about an hour and a half long, so I am going to try to summarize it here with some screen captures, but I would highly recommend viewing the entire video it is amazing. The screen captures just do not do it justice. 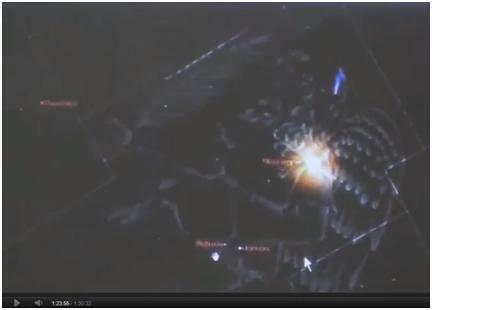 If you are short on time, start at the 1:17 mark through 1:27 to see the context around the screen captures below. If you don’t have time to watch the video now, here is a quick summary of the last 10 minutes. 1 A great sign appeared in heaven: a woman clothed with the sun, with the moon under her feet and a crown of twelve stars on her head. 2 She was pregnant and cried out in pain as she was about to give birth. 3 Then another sign appeared in heaven: an enormous red dragon with seven heads and ten horns and seven crowns on its heads. 4 Its tail swept a third of the stars out of the sky and flung them to the earth. The dragon stood in front of the woman who was about to give birth, so that it might devour her child the moment he was born. 5 She gave birth to a son, a male child, who “will rule all the nations with an iron scepter.” And her child was snatched up to God and to his throne. 6 The woman fled into the wilderness to a place prepared for her by God, where she might be taken care of for 1,260 days. We will see this play out in the heavens over the next couple months, September and October, 2011. Lets review the key actors or players in this signs in heaven. Revelations 12:1 – 1 A great sign appeared in heaven: a woman clothed with the sun, with the moon under her feet and a crown of twelve stars on her head. 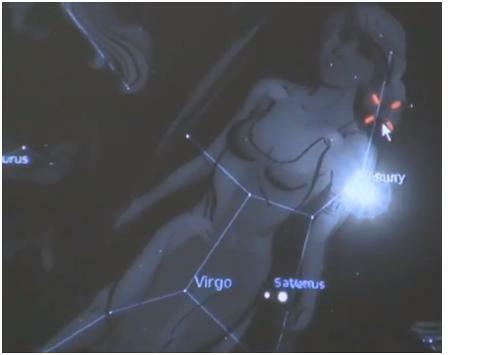 The woman is the constellation Virgo, she will be clothed in the sun (wearing the sun as a tunic) the moon will be under (at) her feet and a crown of twelve stars on her head (Virgo has 12 stars that make up her head) and the Comet Elenin with its tail will shine like a blue crown in her head. 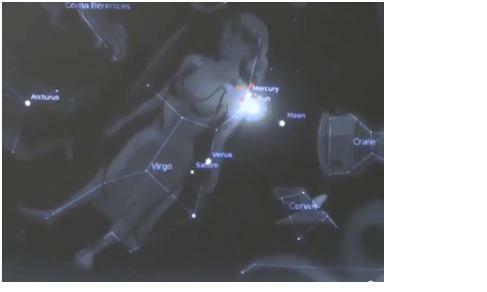 The Picture below is from Stellarium on 09-26-11 as the sign comes together… The four red arrows are Elenin, he put a tracker on it so we can see it move in the video. 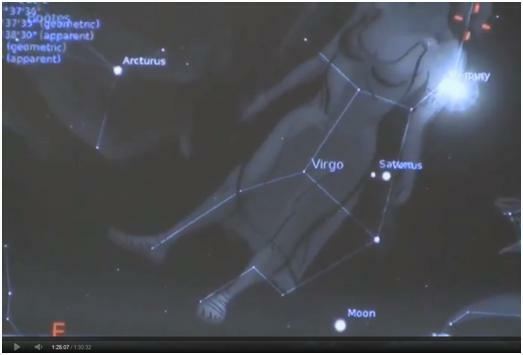 Here is what we will see on September 26th, 2011 in the eastern sky. Notice she is clothed in the sun. The other players Venus, Saturn, our Moon, and Elenin are moving into position. Revelations 12:2 – She was pregnant and cried out in pain as she was about to give birth. 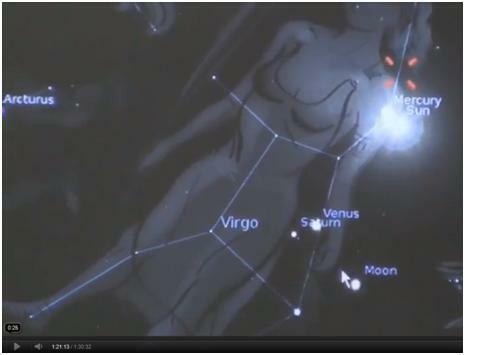 Elein will shift up toward Virgo’s face and the comet tail makes it look like she is crying. I do not have a screen shot of this but he mentions it in the video and you can see it by playing the stary night application. 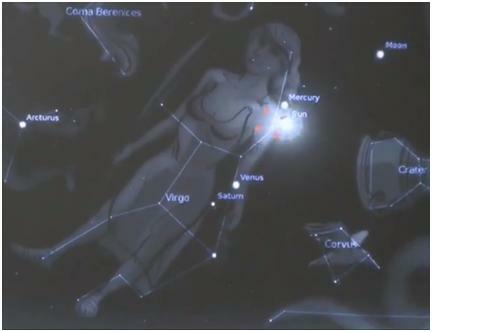 Venus is also moving into Virgo’s womb as if she is pregnant with child (Venus). You will notice that Elenin is making its way past the sun and toward her head, Venus and Saturn are moving into her midsection, and the Moon is dropping toward her feet. Revelations 12:3-4 – Then another sign appeared in heaven: an enormous red dragon with seven heads and ten horns and seven crowns on its heads. 4 Its tail swept a third of the stars out of the sky and flung them to the earth. The dragon stood in front of the woman who was about to give birth, so that it might devour her child the moment he was born. Saturn is known to represent Cronus, which is known as the dragon. If you look up Cronus in Wikipedia, it talks about the legend of Cronus devouring his children as he feared they would fulfill the prophecy of replacing him. Saturn this whole time all of these heavenly bodies are moving through the heavens is sitting still waiting for the birth of Venus (the morning star) so he can devour him. Venus has moved fully into her womb, she is still clothed in Sun, Elenin is moving into position to show as tears during the birth, and the moon has dropped further toward her feet. Saturn (the dragon) still waits by Venus to devour him once birthed. Venus and Saturn remain in her womb. The sun cloths her and Elenin is moving into her hair to show as a crown. The Moon its decent into a position by her feet. Venus and Saturn remain in her womb. The sun clothes her and Elenin has moved into her hair to show as a crown. The Moon has moved into a position by her feet. Revelations 12:5 – 5 She gave birth to a son, a male child, who “will rule all the nations with an iron scepter.” And her child was snatched up to God and to his throne. This is associated with Jesus Christ and the Church being snatched up to God and his throne. Christ was taken up to heaven to rule with the Church (his bride) by His side following the rapture. Revelations 12:6 -The woman fled into the wilderness to a place prepared for her by God, where she might be taken care of for 1,260 days. Foreshadows the nation of Israel fleeing into the hills after the rise of the Antichrist, the dragon, that has tried for the length of history to devour God’s Son, Christ, his chosen people Israel, and Christ’s bride, the Church. I hope you get a chance to watch the entire video about the signs of what is to come. It is very exciting and amazing to see God’s word play out in front of our eyes! Christ said we need to stay watchful during these last days. We need to wake up those that aren’t. May Christ be with you! A spectacular series of events are coming together in the heavens and in the news that are either an incredible series of coincidences, or else they are the prophetic fulfillment of Revelation chapter 12. I believe these signs are prophetic fulfillment, and they are telling us that Daniel’s 70th week is about to begin. Let me begin by saying that I have no idea when the rapture of the Church is going to take place. James, the brother of Jesus, told us that God is busy taking a people for Himself from among the Gentiles (Acts15:13-18). The only thing that is holding up the rapture is the arrival of the full number of Gentiles which God has determined in advance (Romans11:25and Acts15:13-18). We have no way of knowing what this number is, so we have no way of knowing when the rapture is going to take place. To make things even more impossible, we do not know how many people are already in heaven or at what rate they are arriving. This article is not about when the rapture of the Church will happen. Instead, it deals with the beginning of Daniel’s 70th week and the 7 year period of tribulation that begins at the same time, complete with 3 sets of 7 judgments upon mankind. If you should happen to believe in a pre-tribulation rapture, as I do, then you will know that the rapture can (and most probably will) happen sooner that most believers expect. Astrology is a sin and is strictly forbidden by God. However, God does use the position of the sun, moon, and stars to indicate certain holy days, feast dates, seasons, and even how to calculate the length of months and years. God used a sign in the heaven to guide the wise men to the infant Jesus. I have always believed that the moon, the stars, the planets, and all of the other lights in the heavens, such as galaxies, nebulas, asteroids, and even comets, are God’s jewelry which He has put on display for our enjoyment and for us to wonder at as we ponder His immense greatness. God wants us to admire his magnificence in the heavens, but he does not want us to worship anything that is there, other than Himself. At the moment the comet Elenin is passing through our solar system. In ancient times, comets were seen as being messengers that brought warnings of natural disasters and times of tribulation on the earth. Could Elenin be a sign of the beginning of the 7 year period of tribulation before the 2nd Coming of our Lord, which we more accurately refer to as Daniel’s 70th Week? Or is Elenin’s appearance at this time and place in the sky just a series of coincidences that only appears to be a fulfillment of Revelation 12? And a great sign appeared in heaven: a woman clothed with the sun, and the moon under her feet, and on her head a crown of twelve stars; and she was with child; and she cried out, being in labor and in pain to give birth. And another sign appeared in heaven: and behold, a great red dragon having seven heads and ten horns, and on his head were seven diadems. And his tail swept away a third of the stars of heaven, and threw them to the earth. And the dragon stood before the woman who was about to give birth, so that when she gave birth he might devour her child. (Revelation 12: 1-4 NAS). And when the dragon saw that he was thrown down to the earth, he persecuted the woman who gave birth to the male child (Revelation 12:13 NAS). And the dragon was enraged with the woman, and went off to make war with the rest of her offspring, who keep the commandments of God and hold to the testimony of Jesus (Revelation 12:17 NAS). During the second half of September, the comet Elenin will be in the constellation of Virgo, the virgin. 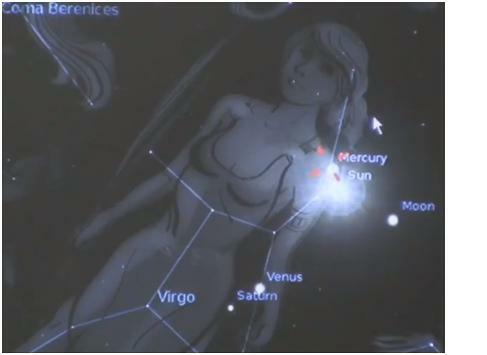 The sun will also be in Virgo, so the woman (Virgo) will be clothed with the sun. At the same time, the moon will be at the feet of Virgo. During the latter part of September, Elenin moves up the face of Virgo to a place where it would almost appear to be the tears coming from Virgo’s eye as she cries out in pain as she is about to give birth. Then Elenin moves further up Virgo’s face to rest on the top of her head, like a crown. Actually, it will look like a tiara among twelve stars above Virgo’s head. All of this will fall into place onSeptember 29, 2011. Comets are rare, and for one to appear in this scenario with Virgo, the sun, moon, Saturn, and Venus would be incredibly rare, indeed. But there is more. . . The planet Venus is in the mid-section of Virgo as if it were a child in its mother’s womb. Saturn is also present and in the right position, as if it were a dragon waiting for the child to be born, so that it could devour the child. Perhaps it is just coincidence, but in the world of legend and the occult the Roman deity, Saturn, has always been regarded as a dragon and was identified with the deity Cronus. According to legend of Cronus, he was to be killed by one of his children, so Cronus would wait nearby each time one of his children was to be born and then he would devour the child as soon as it was delivered. In Revelation 12 the woman represents the nation of Israel. When the dragon persecutes the woman and makes war with the rest of her offspring we will be experiencing the 7 year tribulation period of Daniel’s 70th week. I am not attempting to predict the exact date that Daniel’s 70th Week will begin. What I am saying is that a remarkable series of signs are coming together on the last couple of days of September that certainly seem to warn of the imminent resumption of Daniel’s 70th Week and the 7 year period of tribulation on the earth which is a part of Daniel’s 70th Week. There is an excellent presentation of these events on You Tube by Anton Fiori of Crimson Pill TV entitled, Elenin & Prophecy: “Fulfills” Revelation Ch 12 on 9-29-11. I am sure this is just a coincidence as well, but during the second week in September the Palestinians are going to seek full membership in the United Nations based on the borders prior to the war in 1967, withEast Jerusalemas their capital. God has made it very clear that He will not tolerate anyone taking land from His chosen people and He is particularly sensitive about His holy city,Jerusalem. I believe that if anyone wants to look for prophetic signposts they need to watchIsrael, and particularlyJerusalem. God considersIsrael, and particularlyJerusalem, to be the center of the world. I am not predicting that worldwide tribulation might break out because of these actions by the Palestinians. After all, things have been real peaceful and lovingly quiet over there for years – right? I am just glad that I will be on the opposite side of the planet on that day and if you find me hiding in a deep cave, that will just be a coincidence as well. The Bible tells us that in the last daysIsraelwill be all alone in the world with few, if any, friends. The Lord warnedIsraelthat they would be hated and persecuted by all nations because of Him (Revelation 12:9). TheUnited Statesis one of only five nations that have veto power in the United Nations. If theUnited Statesshould fail to veto statehood for the Palestinians, this final piece of prophecy would come to pass. Speaking of coincidences, the first day of Rosh Hashanah occurs on September 29, 2011(Tishrei 1). This is the Jewish New Year and it also the day that some believe is the actual birthday of Jesus. This could certainly be as good of a time as any for Daniel’s 70th Week to randomly begin ticking away again. When the prophet Daniel was about 80 years old the angel Gabriel gave him a prophecy about the future. This prophecy is recorded in the chapter 9 of the Book of Daniel, and is often referred to as God’s Prophetic Time Clock.Israelwas given 70 weeks of years (490 years) to accomplish 6 goals. It further says that after 69 of those 70 weeks (483 years) the Messiah would come but would be rejected and killed, theTemplewould be destroyed, the prophetic time clock would stop, and the people would be dispersed. We know that during a gap in time of unspecified length God would take a people for Himself from among the Gentiles. When the full number of those Gentiles has “come in” God will turn His attention back toIsrael, and the clock will start running again for the last week (7 years). This is where, I believe, we are now – just seconds away from the clock beginning to tick again. Rosh Hashanah is also known as the Feast of Trumpets. In the New Testament there are two very special occasions for the blowing of trumpets. They are the rapture and the 2nd Coming. Rosh Hashanah takes place at the time of the new moon, rather than a full moon, when only a tiny sliver of its surface is visible. The timing of the new moon is difficult to predict, and a minimum of two visual sightings are required to confirm it. For this reason, Rosh Hashanah has come to be known as the feast where “no one knows the day or the hour”. It is also interesting to note that Jesus told us in 4 places in the Bible that “no one knows the day or hour” of His return. This is pure speculation on my part, but wouldn’t it be a remarkable coincidence if He was actually giving us a hint as to what day to look for His return? Actually, I believe there are incredibly few things which occur in our universe that are truly random. Our God is an incredibly precise God and everything we see in our universe, from the motion of the planets and stars, to the microscopic world of the building blocks of life, to the infinitesimally small world of atomic particles, are incredibly precise. I believe that God rarely ever uses the word “approximately.” This is why I find it so hard to believe that either the rapture or the 2nd Coming of our Lord will occur on a day which has no special significance other than being the day when the counter on the gates of heaven just happen to click on the pre-determined number set in advance by God. Several thousand years from now when we are all sitting around in the New Jerusalem reminiscing about how it was “back in the day” on the “Big E” (earth), I am certain that there will be armchair quarterbacks with their 20/20 hindsight who will be proclaiming how they cannot possibly understand why the people on earth could have missed all of the signs and not possibly known the exact day of both the rapture and the 2nd Coming. What they will fail to realize is that looking backward is easy. Trying to interpret the signs of the times in advance is almost impossible because there are so many of them. There are so many signs out there it is becoming increasingly difficult to see the road. There are many other events happening in the world at this moment that suggest the start of Daniel’s 70th Week is at hand. Daniel’s 70th Week will begin with a series of 3 sets of 7 judgments that will start off bad and get progressively worse until, the Bible tells us, all life will be destroyed if God does not intervene to stop them. The beginning of these judgments involves the four horsemen of the apocalypse which we find in chapter 6 of Revelation. The first horseman rides a white horse and represents the anti-Christ, who goes forth conquering and to conquer (Revelation 6:2). The entire Islamic world is in turmoil at the moment and is without a leader. This huge power vacuum is going to be filled with somebody very soon because nature does not like a vacuum. I shudder to think who this person will be, but if he is the leader of all of the angry Muslims out there, he is not going to be a very nice guy. The second horseman rides a red horse and is going to take peace from the earth (Revelation 6:3-4). I can certainly see how theMiddle Eastis ready to explode into war and pull the rest of the world into the conflict. In fact, I am truly amazed that we have had peace for this long. The third horseman rides a black horse and is going to bring famine and economic collapse (Revelation 6:5-6). As I sit here and type, there are 12 million people inAfricawho are starving in the severest drought in 60 years. In fact, this drought has been declared the worst humanitarian crisis in all of history. North Koreais also experiencing severe famine, as well as parts ofChina,India,Pakistan, and many other parts of the world. As for economic collapse, most of the world’s countries are in serious economic trouble withGreece,Ireland,Spain,Italy, andPortugalon the verge of default. TheUnited Statesis not doing real well at the moment, either. The fourth horseman rides a pale horse and brings death, followed by hell (Revelation 6:7-8). One-fourth of the world’s population will die in the seal judgments (Revelation 6:8), and a third of those who survive will die in the trumpet judgments (Revelation9:15). I can certainly see how deaths could easily number into the hundreds of millions as a result of the first three horsemen riding forth. I can also see how hell could follow closely behind. There will be incredibly few believers around when the four horsemen start their ride, especially if the rapture of the Church has already occurred. Unbelievers who die go to hell, yet I seriously doubt that there are any unbelievers in hell once they get there. When I look at conditions in the world at this moment, I cannot help but wonder how things could have become this bad without Daniel’s 70th Week actually starting, but we still have to see someone confirm a covenant, or series of covenants, with Israel (Daniel 9:27). I am sure that it is also a coincidence, but September is when the “don’t ask, don’t tell” restrictions will be officially lifted in our military and homosexuals will obtain the special, privileged status they have sought after for so long. September is also when Egyptis scheduled to have its elections in which the Muslim Brotherhood is expected to win. September 11, 2011, will also be the 10th anniversary of when our nation was attacked. God has given each of us gifts in this life and we are expected to be good stewards of both our lives and these gifts. If we think that we know the date when our Lord will return, it is important that we continue to be good stewards of our lives and our gifts until the Lord actually arrives. It is also very important that we do not cause any of our brothers or sisters to be harmed by our guessing. The most important thing for us to do is to be ready when the Lord does arrive. If anybody should happen to read this article and wants to either agree or disagree with me, my e-mail address is oaktree3168@aol.com. One of the big items that looks to be aligning with other prophecy events this September is ELENIN showing up and crossing between Earth and our Sun. There has been much mystery about how big this object is and what exactly it is but we do know it will be showing up with its closest approach to earth on 9/29/11. Does that date ring any bells? It is this years Feast of Trumpets! Wow! This is something you should look into as it has impacts across multiple prophecies. There is still a lot of varying information out there on the name and size of the object but the most recent sizing is much larger than Frank has in his post below. Current estimates show that it exceeds 200,000 km in size. Just for comparison sakes, the Earth is a little under 18,000 km in diameter with the Sun weighing in a little over 1,300,000 km. So it is 16 X the size of Earth. Something to pay attention to? Government experts are saying it will have no impact on earth. Does that seem logical? Possible? The gravitational impact of something like that on our planet could be significant. Could it produce some of the events the bible speaks of? I would say yes. I will post more as I uncover it and verify it. Very exciting, time is drawing short! His return draws nigh! Prophecy Sign: Jesus in Luke 21:11, 25 warn us of the signs that will come from the sun, the moon, and the stars. Finally in the main stream news today CNN has reported on this object coming toward Earth. This is the object that will arrive during the Feast of Trumpets. Will this huge mass cause the “great earthquakes and the roaring of the seas and waves Jesus warned us about? Stay tuned, September is just around the corner. Comet ELENIN, Earthquakes, And YOU. The Rapture must be pre-tribulation…our blessed hope! Excellent series on the coming Rapture and why it must occur before the seven year tribulation. It is so exciting to see all of the prophecies coming together and intertwining to fulfill God’s word. It warms the heart. Time is short though, we must stay vigilent and continue to expose people to bible prophecy! I will post the additional pieces of this sermon series once they become available. Comet Elenin…coming to a fall feast near you? More information on Comet Elenin from Frank Dimora’s site. It is amazing once you see the orbits and how complex they are and how the alignment ends up perfectly with the Fall Feasts. What is coming this Fall? Fall Feasts and Comets oh my! I really like this guys sermons. Please check out is past material too. It really appears as if this fall will be an eventful. God is great! We will not know the day or the hour but we will know the season!